Tracing back the lineage of the “bedroom producer” shouldn’t, by rights, pose too much difficulty or heavy research. Relatively speaking, it’s a modern concept, and adopted by a wealth of fledgling young artist-producers. Who needs a ship-sized mixing desk and an inflated studio budget when you have a trusty Macbook Pro and Fruity Loops to plug into? Yet, typically, it’s already become a term that carries with it similar baggage to the modern-day troubadour. Anxious, nocturnal musicians with a penchant for internet forums has become as reliable a vision as the battered guitar case and finger of whiskey in a backstreet speakeasy. Difficult to shake. 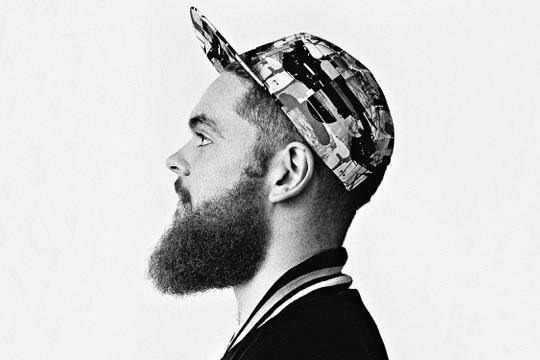 “It’s a bloody minefield!” grins the larger-than-life Jack Garratt, stroking that fine ginger beard of his in contemplation. The glimmers of frustration might be borne from the journey he’s already taken with his music. Starting out as an acoustic singer-songwriter, Jack’s early shows were as much about finding out what he didn’t want to do, as much as what he did. A fine, intricate guitarist with a rasping vocal, His performances were smattered with a gift of the gab repartee that suggested part stand-up, part tortured folkster. Truth be told, he wasn’t even sure music was a legitimate pursuit, and was already training to become a primary school teacher when he dropped it all for those drums sticks, pads and keys. Jack’s first release, the Remnants EP (self-released through Bubinga Records) is an invigorating, almost spiritual listen. It marries those distinct elements of electronica with classic guitar-fronted songwriting, which found their skeletal shape with repeat listens to Channel Orange by Frank Ocean. Conversely, another record that refused to budge from the stereo was Jack White’s Blunderbuss. Born and raised in Little Chalfont, a quaint village in Buckinghamshire England, Jack’s parents were musical and he learned to play instruments early, something he’s never really stopped doing. Those initial acoustic shows were largely open-mic, but the vision was to take the new sound and shows somewhere else completely. Everything you hear, both on stage and off it, are performed by Jack. The intimacy of the blues and Jack’s scintillating raw can be juxtaposed with a bassline that rattles the foundations of the building. He keeps you on your toes. Your hands in the air. That Jack has produced his own music is testament to the influence of leftfield production. He cites Flying Lotus, Son Lux and Jai Paul as primary examples of taking something and twisting it into something obtuse, fresh, and interesting. That Jack is producing his own music when one of the greats, Rick Rubin, has been exchanging emails and lays claim to discovering Jack, is also testament to his blossoming position within the production world. “I doubt I’ll always produce all my own stuff, but at the moment I’m happy doing so. I definitely want to work with other people though, and collaborate on other artists’ music. There’s so much amazing stuff out there. The forthcoming second EP is indeed a quantum leap on from Remnants. The first track, The Love You’re Given, has already racked up over 1.5 million Spotify streams in a few months, but its standout is Chemical, a gnarly beast that tangles multi-tracked handclaps with a beats-laden dancefloor hookline. You can’t place it, but you know it’s destined for far bigger venues than Jack finds himself at on these opening steps. Jack commenced 2015 on Zane Lowe’s Radio 1 Future 15 for 2015 list, and the live recording of The Love You’re Given from his Future Festival show has already become a firm favourite across the station. Their support follows the track hitting number one on the Hype Machine, testament to loyalty of the blog fraternity, who have been onto Jack before he’d barely posted his first debut. The future, it bodes well indeed.